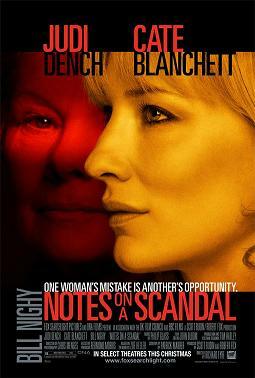 Patrick Marber wrote the screenplay for Notes on a Scandal about Sheba (Cate Blanchett), a high school teacher who confides in Barbara (Judi Dench), a colleague and neighbor who witnesses her secret affair with one of her students, Steven, played by Andrew Simpson. Based on the novel by Zoe Heller. Richard Eyre has written the screenplays for such film as Closer, Asylum and the upcoming film The Tourist. He has also written plays such as "Closer" and "Dealer's Choice". I had the privilege to interview him. NYC MOVIE GURU: What’s the main difference between writing a movie and writing a play? PM: The main difference is that you’re trying to tell a story with images in a movie, [but] in a play you’re carrying the narrative, generally speaking, in dialogue. A page of dialogue in a play is completely acceptable. A 3-page dialogue in a movie—do you realize that it’s going to be 3 minutes long, this scene and it’s just talking? You have to really justify it. You have to earn your right to have dialogue in a completely different way. NYC MOVIE GURU: Are you a non-judgmental writer? PM: Sure, very much so. I think it’s very important because I’m not a very judgmental writer. I’m only interested in the story and what happens. I think the second that I start making moral judgments, it’s completely boring and it becomes like school. I really hate when I’m going to plays or films and I feel like I’m being taught a lesson. I’m very interested in stories where you have to arrive at your own conclusion about what happened and why and I don’t like giving the characters too much motivation. I like people leaving the theater or the cinema talking about the thing rather than having the answers given to them. NYC MOVIE GURU: Did you have any input in the casting? PM: Yeah, very much so. Richard [Eyre] and I saw all of the actors together and [he] had final say, of course, but he wanted my opinion and we went on a journey together. NYC MOVIE GURU: In what ways were you involved on the set? NYC MOVIE GURU: Who did you want to play Sheba and Barbara while you wrote the screenplay? PM: We hoped that it would be Cate [Blanchett] and Judi [Dench]. They had read the book [which] had been sent by [producer] Scott [Rudin] and they knew that I was writing a screenplay and they both said, “Yes, we’d like to read that”. So, they knew that no other actor was going to be sent the screenplay before them, but we didn’t know whether they wanted to do it. NYC MOVIE GURU: Did Judi Dench change the script in any way? PM: No, she read the script and liked [it]. The script changed over a period of time, but it was always a given that Sheba was not only going to be seen from Barbara’s perspective. NYC MOVIE GURU: How much control did author Zoe Heller have on your script? PM: [Author Zoe Heller] wrote a couple of drafts. She, kind of, wanted to know what was going on, but she didn’t want to really stick her nose in it too deeply, so she let me get on with it, but we spoke, we emailed [and] became friends over a 2-year period—we’re still friends, thank God. She never wanted to control how it would be. She knew that once she sold it, it was going to become something else. I told her that and she knew that—her dad was a screenwriter, he husband’s a screenwriter, [so] she knows what we do. She embraced the changes. Fortunately, she liked me [and my play,] “Closer”. She like the kind of writer I am [and] was quite excited when I invented something or changed something, particularly what I did with Sheba’s character. The book is much less bohemian—[it’s] more upper-middle class [and] a slightly posher entity. She liked what I did with [Sheba], which I, kind of, fashioned for Cate. NYC MOVIE GURU: Did you change the relationship between Sheba and Barbara for the screenplay? PM: It was something that I pushed further that wasn’t so apparent [in the book]. I made the theme of the film loneliness and how we deal with it. So, therefore, I emphasized the elements of those 2 characters that were similar in strange ways, so that became my take on the material. NYC MOVIE GURU: How many scenes were cut? PM: About 10 or 15 minutes worth. They won’t be on the DVD. As a principle, I think Richard [Eyre] feels, and I’m with him on this, that the stuff you cut, you cut for a reason and you cut it because it didn’t need to be in the film and, therefore, it’s a, kind of, self indulgence to go, “And here is some other stuff that wasn’t quite right for the film”. It’s, kind of, ghoulish, I think—which isn’t to say I don’t love watching those scenes; I love watching them, but he takes a, sort of, very stringent view of this. But, then again, he’s not in control of what’s on the DVD. I dare say if Fox Searchlight want to put stuff in, they will. But, I wouldn’t mind [that]. In the screenplay that I just published, there are some scenes that weren’t in the film. NYC MOVIE GURU: Does Richard Eyre allow for any improvisation? PM: [During] the big argument with Richard and [Sheba], [director Richard Eyre] might say to them, “Look, improvise your way in and then come onto the script and stay on the script and then, at the end of the take, just say whatever you want—there might be some useable stuff”. I would fully support that that you give them a pit of playtime at the beginning and end of the take. I’ve got no objection if they get stuck and need to find their way through to the next line that’s scripted. I’ve been in films where they’ve mucked around with the script and it’s humiliating. If you’re lucky and get to work with great producers and great directors as I have done, they respect the script and they respect you and you respect them. NYC MOVIE GURU: Do you see any similarities between Notes on a Scandal and the work of other directors? PM: As we were working on [Notes on a Scandal], we began to realize what we were making and it became more of a, kind of, continental Almodovar/Hitchcock/Chabrol entity. It was one of those films that slowly began to cohere as to what it exactly was. Sometimes the thing itself will speak to you and tell you, “I’m this and not that.” and that was something we started to realize that the event of the film was that which occurs between Barbara and Sheba and we wanted more of that—more wattage. NYC MOVIE GURU: Are you excited to attend the Golden Globes in LA? PM: Some people hate going to LA, but I love going [there] because it’s [foreign] to me. I always have a great time. They put me in a nice hotel and they fly me first class surrounded, so I’m very happy.